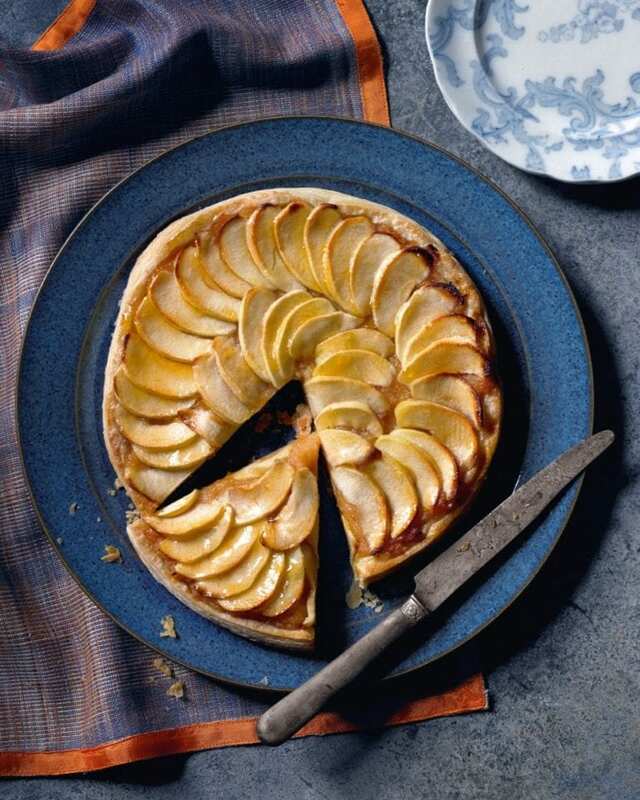 Rick Stein’s apple tart recipe manages to be both rustic and sophisticated. It doesn’t use too many ingredients either so you can rustle this one up in no time. Roll out the pastry on a lightly floured surface and cut out a 30cm circle using a plate as a template. Lift onto a lightly greased baking sheet and prick the pastry here and there with a fork, leaving a 2.5cm border clear around the edge. Spread the fruit purée on top, again leaving the edge clear, and chill for at least 30 minutes. Preheat the oven to 200°C/fan180°C/gas 6. Peel and core the apples and slice them quite thinly. Arrange the slices, overlapping slightly, in circles on top of the fruit purée, then sprinkle them heavily with the remaining sugar. Bake for 30 minutes or until the pastry is crisp and golden and the edges of the apples are lightly browned. Put the apricot jam into a small pan with 1 tbsp water (or reserved apple cooking juices, if you have them) and warm gently. Press through a sieve into a bowl, then brush generously over the apples. Serve the tart warm or cold, on the day it’s made, with crème fraîche. There are instructions for apple purée too, as quinces are extremely seasonal, but they do give the tart a unique and almost smoky-sweet taste.